As many as 140,000 Quebecers will ‘drop, cover and hold’ Thursday morning, as they part in an emergency earthquake drill Thursday morning. 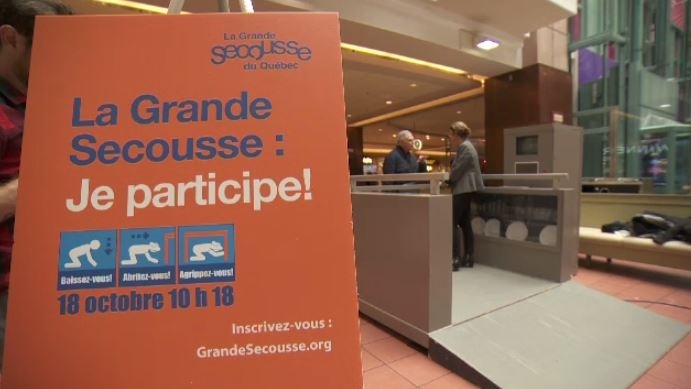 Quebec’s campaign also includes an earthquake simulator, which was on display at Place Montreal Trust to help people prepare for a hypothetical disaster. The machine mimics the sensation of three levels of seismic activity, from a 5.1 rumble to an unsettling 6.2 shake, with the highest being a 7.4 magnitude earthquake. 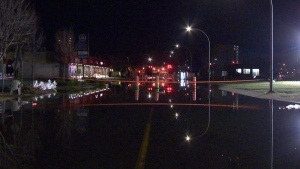 “In an earthquake or tornado or risk like that, you don't have much time to take the right action, so we want to make it a reflex, so people know what to do,” said Isabelle Primeau, spokesperson for The Association of Quebec Civil Security. “Find something that's stable, go underneath it and hold. so then you're protected from anything that could fall,” she said. An earthquake simulator was on display at Place Montreal Trust.